Acupuncture can be an effective alternative treatment to pharmaceutical drugs for a wide range of ailments. This is why parents go for this natural healing method in treating their children. If your child is medication-sensitive, try acupuncture as a treatment for your child as it doesn’t have the side effects of regular medication. Moreover, studies have shown that the adverse effects of acupuncture are mild, and any sensation felt during or after needling are brief. Parents tend to be okay with the Traditional Chinese Medicine approach of acupuncture to help treat their children’s disorders. However, children need to be primed or convinced that acupuncture can be fine for them. There are also extra gentle treatment protocols that guide children’s acupuncture treatment. At times, all the acupuncturist needs to do is to gently insert the needle in and out, with no need for the needles to stay on the skin for a long time. According to a National Health Statistics report in 2007, there were around 150,000 children in the United States who received acupuncture treatment for cases such as abdominal pain, headaches, migraines, anxiety, and musculoskeletal problems. Another related treatment, which is acupressure, doesn’t involve needles, is often used to help children undergoing cancer treatment. A study by Dr. Yuan-Chi Lin from the Harvard-affiliated Children’s Hospital found that children who received acupuncture reported relief from a variety of illnesses such as headaches, back pain, stomach ache, and other chronic complaints. The children experienced less pain after getting acupuncture compared to their condition before the treatment. The children also reported improved sleep, increased school attendance, and more participation in extracurricular activities with the help of acupuncture therapy. An earlier study at the Children’s Hospital also found that 70% of patients experienced pain relief from acupuncture. The conditions that were treated included endometriosis, reflex sympathetic dystrophy, and migraines. Learn more about how acupuncture can help your child. Acupuncture for children varies with age. If a child is under 6 years old, the treatment would just be around 10 – 15 minutes. For ages 6 to 12, it would be 15 – 20 minutes. For 12 to 16 years old, the treatment would span around 30 minutes. 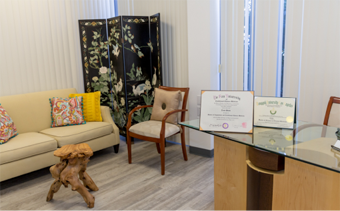 Tram Pham, our licensed acupuncturist, would usually ask children to point out where the pain is, and what is the current pain level on a scale of 1 to 10. As Tram puts the needles in, she will ask the child to mobilize the area to help bring back the energy there. She then re-checks their pain level to see if it has moved to any secondary locations. The treatment continues up until the pain level has at least decreased to 50%. Tram may also prescribe herbal remedies to treat pediatric pain disorders. This can be a tea which they can drink after meals. She can also recommend one of the many topical pain relievers available in our in-house herbal pharmacy. Children and adults find that our affordable and easy to use plasters and oils are of great help in relieving pain. An article published by the journal Pediatrics presented peer-reviewed studies confirming that most adverse effects of acupuncture are mild. Dr. Sunita Vohra, director of the CARE Program for Integrative Health and Healing at the University of Alberta, stated that pediatric acupuncture is safe under trained hands. During an acupuncture session, a practitioner will insert needles into different points on the body. This creates a stimulating or calming effect that can reduce certain symptoms. It can also encourage the release of endorphins in the body, which is why there’s a relieving or relaxing effect after the treatment. If children are afraid of needles, they can undergo acupressure. Acupressure doesn’t involve needles and only involves applying pressure on certain acupuncture points in the body. The procedure can also be taught by a licensed acupuncturist to children, or administered by parents in cases where there’s a lot of anxiety around needles. Acupressure therapies, when done correctly, can provide relief from certain symptoms. Acupuncture treatments are relatively pain-free. The most that children will experience after an acupuncture treatment is a dull ache or slight tingling feeling around the base of the inserted needle. There are instances that a child may cry during the treatment, but the sensation will go away quickly. Your acupuncturist may give a little massage after taking out the needles to lessen the numbing. Acupuncture is a natural, safe and effective treatment for pediatric pain as well as a variety of ailments. It tackles the root cause of your child’s health concerns and holistically heals the body. Book an appointment now by calling 805-563-0222 to get a consultation and treatment which are specific to your child’s health needs. 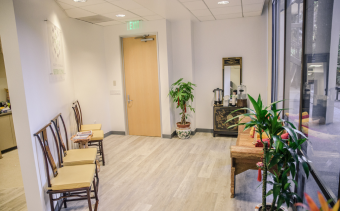 Our licensed acupuncturist and Chinese Medicine practitioner, Tram Pham L.Ac, also conducts phone and video consultations. We also ship herbal prescriptions from our in-house pharmacy to wherever you are in the world.